For those excessive coffee drinkers out there, our deepest condolences as now there will be no way you are going to give up or even cut down. For those who drink coffee a regular amount, apologies for the increase. 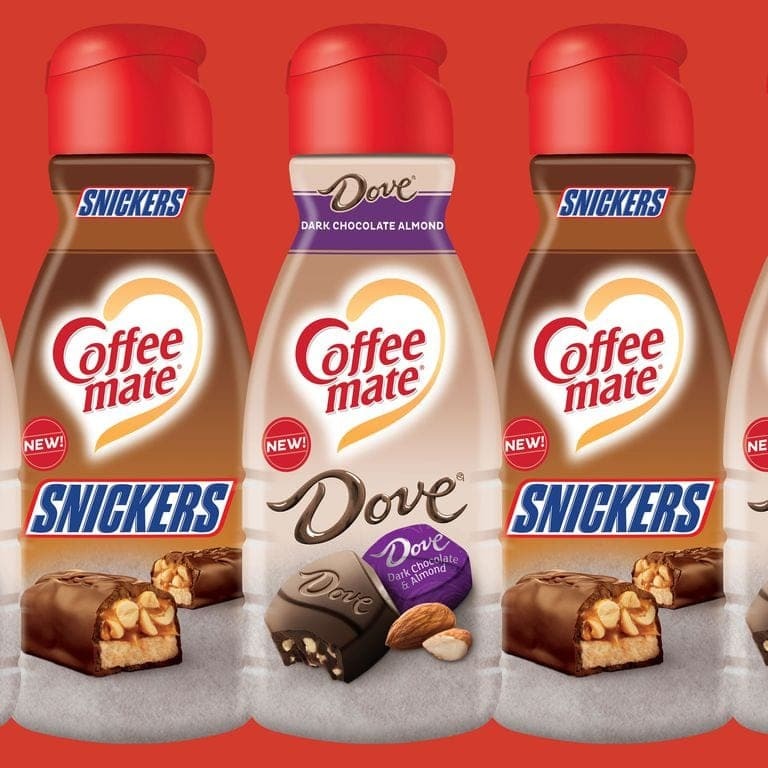 This is because Coffee-mate has just launched Snickers and Dove Dark Chocolate Almond creamers! Yep, you heard right, Snickers and Dove Dark Chocolate Almond creamers! Add a splash of these in your mugs and your daily coffee intake is going to shoot up dramatically. The new products will be hitting shelves nationwide beginning in January, and we can’t contain our excitement. At only $3.59 for a 32-ounce bottle, each container should last in your fridge for a while (despite your new obsession) and you can also save on countless trips to stock up on coffee. The Dove Dark Chocolate Almond creamer has more of a mocha flavor, while the Snickers creamer has great hints of caramel. These new creamers are going to be a game changer. No more tasteless office coffee, long lines or overpriced lattes in the coffee shop franchises, you will now be the King or Queen of coffee. The days of struggling to wake up in the mornings are long gone. You will no longer dread that daily commute as you sip on that sweet candy coffee flavor in the early hours of the day. What’s more, you don’t even need to feel guilty about essentially having a Snickers bar first thing in the morning. Ok, we know January is not ideal as those weight-loss goals will be kicking in, but we just had to share the news! 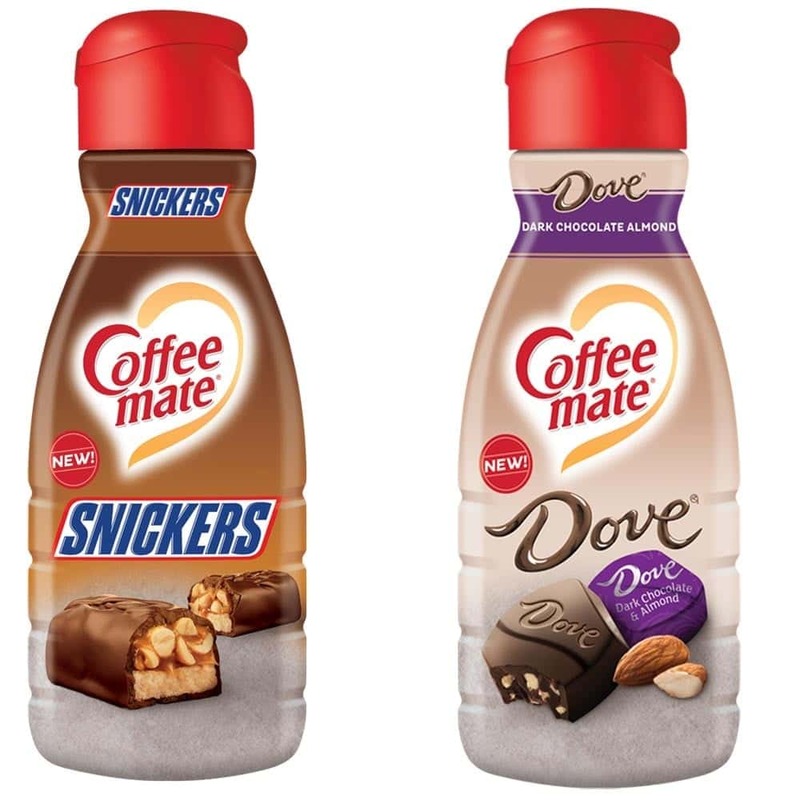 But for those that can’t wait till January, Coffee-Mate has other fun creamers like Cookies & Cream, as well as The Cheesecake Factory-inspired Strawberry Cheesecake and The Cheesecake Factory Dulce De Leche Caramel Cheesecake. Yummm!